Imagine, just for a moment, that you had a free office. As in empty rather than rent free. Like if you somehow managed to eliminate several dozen boxes of paper archives (you know, by getting them digitised, or having them stored off-site) and could actually see further than a metre into the archive room. Just think what you could do with all that space! We do a lot of driving to go and see our clients in person, and these are a few of the ideas we came up with while traversing the highways and byways of the South West. Everyone scoffed at standing desks when they first went on sale, didn’t they? And now look at all the trendy kids with their, “Oh ya, it’s just so fantastic for the posture, don’t you know?” Some of them even have treadmills attached to make them into walking desks. Well, you’ll show them. 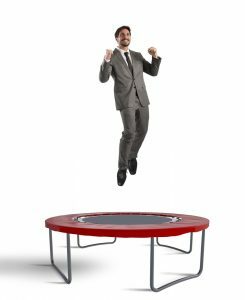 They won’t be laughing when you’ve cornered the trampolining desk market and have the world’s fittest staff. There are studies out there from eminently sensible, scientifically qualified people who have proven that spending time with animals can lower stress levels. You’d need the right kind of animals, obviously. No one’s going to feel especially relaxed after half an hour enclosed in a former storage room with a silverback gorilla or a pack of wolves. But some nice ducklings and puppies and things would be fun. Putting up wallpaper is one of those annoying and fiddly jobs you don’t have to do often. Which means it always starts badly and by the time you start getting good at it, you’re done. And then when it’s time to do it again in a few years, you’ve forgotten everything you learned. The answer? Daily practise. Get in there and make those bare walls beautiful! Everyone needs a hobby. It’s proven to be very relaxing (like being around animals – it might have been the same study). And there’s something just so satisfying about a stress ball. Like chewing gum for your hand. If you go to even a moderate number of conferences and exhibitions you’re bound to come across dozens of them, and they’re free too, so this won’t be an expensive hobby. That’s the definition of win-win, right there. You know you want one. Yes, you do. You do really. Ok, we want one, but we kind of have to dedicate our space to our clients’ documents, so it would be really great if you could make one and then invite us round. You can be Batman, we don’t mind being Robin. Or even Arthur. We’ve always thought he was the unsung hero of that franchise. Everyone can bring their sleeping bags and their PJs, and stay up late eating chocolate biscuits and telling ghost stories. It will be just like Scouts, when they go off to get all their outdoor survival type badges. Only with less trees and mud and, well, the actual outdoors. But still super fun. Not one of those impenetrable bunkers sealed with reinforced steel bars designed to keep assassins at bay. Just a room where people can go when they’re panicking. You know, because they’ve only just remembered that report is due tomorrow and they haven’t started it. Or they heard on the grapevine that Laura in accounts is after volunteers for the company karaoke night. So there you have it – seven perfectly good ways to use an empty office. Can you think of any more? Tweet us your ideas at @scanfilmorstore or post a note on our Facebook page, and we’ll reshare the best ones. And if you’re feeling blue because you don’t have any spare office and you’d like one, get in touch today to find out more about how we can help give you the space to make even your craziest dreams a reality.